SpaceX successfully launched its seventh Dragon resupply mission en route to the International Space Station (ISS) on Tuesday, with the cargo craft lifting off from Cape Canaveral’s SLC-40 atop a Falcon 9 rocket, following a weather scrub on Monday. Bound for a five-week visit to the ISS, the CRS-6 Dragon departed the Cape at 16:10 local time (20:10 UTC). The sixth of fifteen Commercial Resupply Services (CRS) flights SpaceX has been contracted to perform on behalf of NASA, the mission is carrying hardware, supplies and scientific equipment to the space station’s crew. 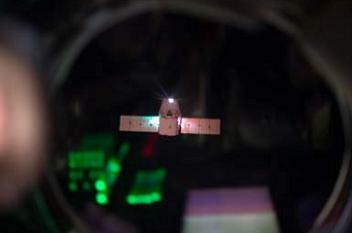 Fifteen small satellites were also loaded aboard the Dragon, for deployment from the ISS’ Kibo laboratory module. SpaceX is one of two companies contracted to perform missions under NASA’s CRS program, with Orbital Sciences Corporation also flying eight missions with its Cygnus spacecraft. The most recent Cygnus launch, CRS-3, failed to achieve orbit and launches are on hold while Orbital’s Antares rocket is redesigned. As an interim measure one Cygnus mission is expected to fly late this year atop a third-party rocket; United Launch Alliance’s Atlas V.
Following on from two successful demonstration mission for the Commercial Orbital Transportation Services (COTS) program; the first a brief solo flight and the second a longer and more complex mission culminating in a visit to the space station, SpaceX began its CRS missions in October 2012. A second mission followed in March 2013 and two more in April and September 2014, with the fifth mission lifting off in January. CRS-6 is the second of up to five Dragon spaceflights this year, with further launches planned for June, September and December. The CRS program originally consisted of 20 missions; twelve for SpaceX and eight for Orbital, with Orbital reducing their mission count to seven with the decision to launch CRS-4 atop an Atlas V, which would provide additional capacity aboard the spacecraft to combine two of the cargoes. Four more flights were added to the program recently, with three being allocated to SpaceX and the fourth to Orbital Sciences. Bidding for a second phase of the program is underway, with second-phase missions due to be awarded later this year. 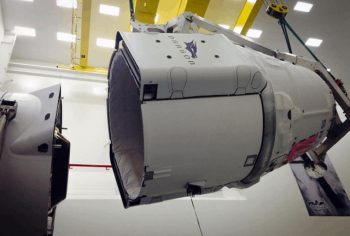 The cargo aboard CRS-6 has a total mass of 2,015 kilograms (4,387 lb; 1,898 kg or 4,184 lb without packaging). This includes 500 kilograms (1,102 lb) of items and provisions for the station’s crew, 518 kilograms (1,142 lb) of station hardware and equipment, 16 kilograms (35 lb) of computer and electronic equipment and 23 kilograms (51 lb) of hardware for EVAs. 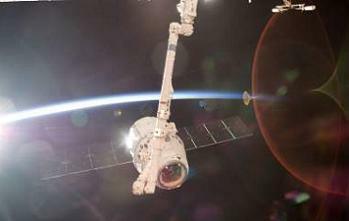 The remaining 844 kilograms (1,860 lb) of the Dragon’s payload will be taken up by scientific hardware and experiments. The scientific experiments being carried into orbit consist mostly of biological investigations; including a rodent research payload to study bone and muscle loss in mice as the result of being in microgravity – which could help scientists find a cure for conditions such as osteoporosis in humans. Another experiment will study how fluid distribution in the human body changes over the course of a long space mission. A crystal growth payload, aimed at producing large crystals of antibody proteins for researchers to study back on Earth will also be conducted aboard the station. Technology demonstration payloads aboard the Dragon include one to study the performance of liquid crystals in microgravity and another that will investigate how a synthetic electropolymer, which could potentially be used to produce synthetic muscles for robots, is affected by radiation in the space environment. 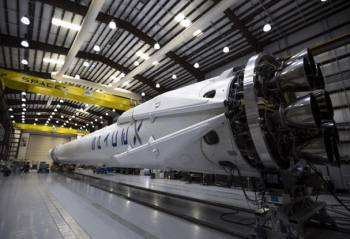 For its return journey, Dragon will be loaded with 1,370 kilograms (3,020 lb) of hardware to be brought back to Earth. The Dragon is the only spacecraft that allows a significant amount of hardware to be returned to Earth from the space station – the only other spacecraft capable of returning items is Russia’s Soyuz, which is limited to what can be fit into the spacecraft around its crew of three cosmonauts. Many of the US and Japanese ISS resupply missions carry CubeSats or other small payloads to be deployed from the space station. CRS-6 is no exception, as the Arkyd-3R technology demonstrator and fourteen Flock-1 Earth observation satellites are hitching a lift to orbit on the launch. A replacement for the Arkyd-3 satellite, lost in October’s Antares launch failure, Arkyd-3R is a three-unit (3U) CubeSat to be operated by Planetary Resources as a pathfinder for its Arkyd-100 telescope constellation. The fourteen Flock-1e satellites will join Planet Labs’ Flock constellation. Utilising a very large fleet of short-lived satellites, named Doves, Planet Labs aims to provide quickly-updated good-resolution images of the Earth, at a lower cost than with traditional imaging satellites. The launch atop a Falcon 9 rocket was SpaceX’s twenty-second orbital launch and the seventeenth flight of the Falcon 9 – not including the Grasshopper and Dev-1 atmospheric first-stage testbeds. Flying in the v1.1R configuration, the Falcon is equipped with deployable legs to attempt first stage recovery after the stage has completed its role in the primary mission. 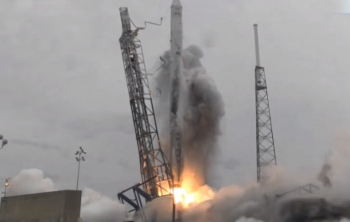 Although SpaceX are yet to complete a successful recovery they came close during the CRS-5 mission in January; losing control of the stage just before it touched down; toppling over and exploding on the landing platform. In addition on several missions where recovery was not attempted the stages performed controlled descents into the Atlantic Ocean. 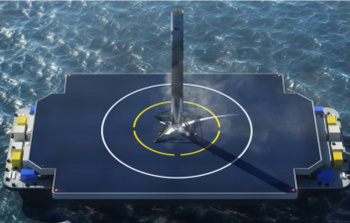 The rocket’s first stage was aiming to touch down on SpaceX’s Autonomous Spaceport Drone Ship (ASDS), a barge converted to serve as a landing target for early Falcon 9 recovery attempts. 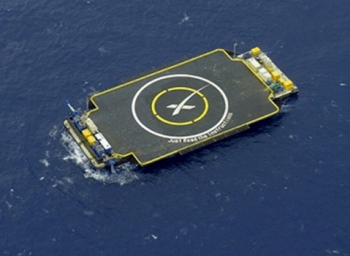 Once the vehicle has proven itself through recovery attempts at sea, landing attempts will switch to a land-based facility. In February, SpaceX was awarded a contract to use Cape Canaveral’s derelict Launch Complex 13 as a landing site for the Falcon’s first stage. The CRS-5 and DSCOVR launches both included attempts to land on the ASDS, with the CRS-5 landing attempt unsuccessful due to a hydraulic problem in the final stages of descent that resulted in a loss of control. Sea conditions at the time of the DSCOVR launch were not suitable for a recovery attempt so the rocket was commanded to simulate a landing in the Ocean instead. Sadly, the CRS-6 first stage hit the ASDS too hard for recovery. 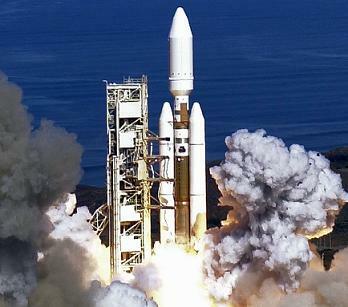 The launch took place from Space Launch Complex 40 of the Cape Canaveral Air Force Station. The pad, which was constructed in the 1960s, originally served as one of two East Coast launch sites – along with the nearby Launch Complex 41, which is now used by the Atlas V – for the Titan IIIC rocket. Twenty-six Titan IIIC vehicles were launched from LC-40 between 1965 and 1982, including the rocket’s first and last missions. These were followed by eight Titan III(34)D rockets between 1982 and 1989 and four Commercial Titan III launches between 1990 and 1992. Seventeen Titan IV rockets were launched from Complex 40; the first in 1994 with a Milstar communications satellite and the last in 2005 carrying the final Lacrosse radar imaging spacecraft. From 1999, it was the only East Coast Titan launch complex as SLC-41 had been deactivated and was undergoing redevelopment to support the Atlas V.
The final Titan launch from the complex in April 2005 was the penultimate flight of the Titan family of rockets, with the rocket being retired after its last launch from Vandenberg six months later. During its time as a Titan launch pad, notable launches from SLC-40 included a Titan IIIC mission with a mockup of the Manned Orbiting Laboratory (MOL) space station along with a Gemini spacecraft – the same capsule used for the Gemini II test flight – in 1966, the 1992 launch of NASA’s Mars Observer mission on a Commercial Titan III and the launch of the Cassini-Huygens mission to Saturn in 1997 by a Titan IV. The demolition of Titan facilities at SLC-40 began shortly after the pad was leased to SpaceX in 2007, with the pad’s mobile service structure being demolished in a controlled explosion on 27 April the next year. Falcon 9 went vertical at the pad for the first time on 10 January 2009, with the first production vehicle conducting facility checks at the site. 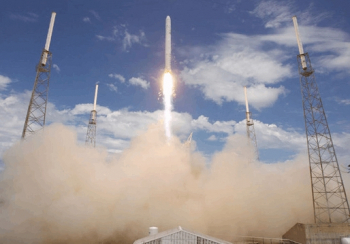 The Falcon 9 made its maiden flight from SLC-40 in June 2010. All but one of the Falcon 9’s launches to date have taken place from SLC-40; the exception being September 2013’s flight with CASSIOPE which departed from SpaceX’s West Coast pad, Space Launch Complex 4E at Vandenberg Air Force Base. 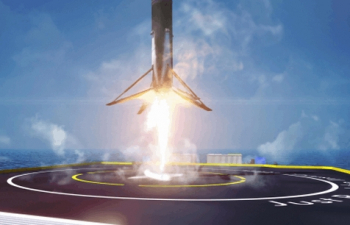 The Falcon 9’s first stage is powered by nine Merlin engines; in the v1.1 configuration these are the Merlin-1D variant – arranged in an octagonal, or OctaWeb, configuration with eight outboard engines arranged around a central motor. Burning RP-1 propellant oxidised by liquid oxygen, the first stage came to life three seconds before liftoff, with the engines checked out and ramping up thrust during the final seconds of the count. At T-0 the Falcon was released, climbing away from her launch complex. Aligning itself to a flight azimuth of 46.64 degrees the rocket headed downrange, passing through the area of maximum aerodynamic pressure, or Max-Q, at one minute, 23.79 seconds mission elapsed time. First stage flight lasted two minutes and 39.31 seconds before the stage cut off, separating 1.92 seconds later to begin its landing attempt, which all went to plan, bar the landing. Continuing the CRS mission, the Falcon’s second stage ignited 7.78 seconds after staging; firing its Merlin Vacuum engine for a six minute, forty eight second burn. The Dragon jettisoned the nosecone that protected its berthing mechanism during ascent, with this event occurring 39.06 seconds into second stage powered flight. The rocket achieved orbit nine minutes and 34.25 seconds after launch, and the second stage cuting out about three seconds later, establishing a deployment orbit of 199.43 by 363.82 kilometres (123.92 by 226.07 statute miles, 107.68 by 196.45 nautical miles), inclined at 56.16 degrees. Spacecraft separation occurred ten minutes and 11.41 seconds mission elapsed time; 34.4 seconds after second stage cutoff. Whilst the second stage was continuing towards orbit, the first stage was descending towards its landing attempt. During its descent, the stage made three burns to reduce its velocity and keep itself on course towards the landing ship. The first descent burn lasted 27.68 seconds, beginning at four minutes and 29.19 seconds after liftoff to reduce the distance that the rocket will travel downrange. Six minutes and 31.63 seconds after launch, grid fins on the first stage were deployed to stabilise its descent, with a second burn beginning 12.17 seconds later to slow the vehicle during reentry. The third and final burn took place as the rocket approached its landing target, beginning at eight minutes and 0.12 seconds mission elapsed time. Almost twenty-four seconds into the burn the rocket deployed its landing legs with touchdown expected six seconds later; eight minutes, 30.01 seconds after liftoff. The engines were to cut off about 2.3 seconds after landing, but with the unsuccessful landing, this is unlikely to have been a nominal event. Had recovery been completed successfully the stage would have been returned to land atop the ASDS, before being refurbished for further testing. These tests will help to determine the parameters for future reuse of recovered Falcon first stages. 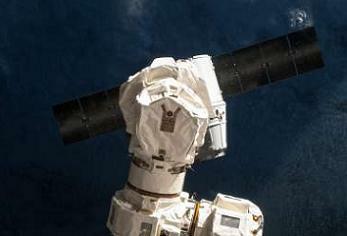 After separating from the Falcon 9, the Dragon spacecraft will begin its early on-orbit operations. Starting with the deployment of the spacecraft’s solar arrays two minutes into free flight, early operations will continue with the opening of the spacecraft’s guidance, navigation and control bay two hours and twenty minutes into the mission. The first manoeuvre will be a coelliptic burn to circularise the spacecraft’s orbit, twelve hours and 53 minutes after launch. 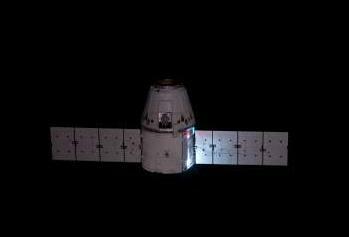 During its second day of flight the Dragon will close on the International Space Station, making a series of manoeuvres to set up an approach on the third day of the mission. Performing an approach to within 10 metres (33 feet) of the station along its radial vector, or r-bar, Dragon will be captured by the station crew using the Canadarm2 remote manipulator system. After a successful capture, the Dragon will be berthed at the nadir, or Earth-facing, port of the station’s Harmony module. The Dragon will stay berthed at the space station for a little under five weeks, with its cargo being unloaded and replaced with refuse and items to be returned to Earth. A day before its scheduled departure, the final cargo will be loaded and the hatches closed. Departure day operations will conclude with unberthing of the spacecraft, again using Canadarm2 and its subsequent release from the robotic arm. 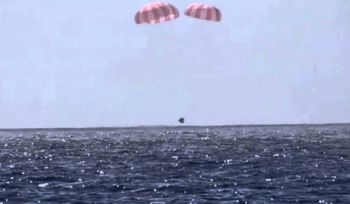 Following a series of departure burns the Dragon will be deorbited, jettisoning its Trunk section, reentering and descending under parachute into the Pacific Ocean, where it will be recovered by ship. The launch was the fourth of the year for SpaceX and its Falcon 9 rocket; previous launches having carried the CRS-5 Dragon mission, the NOAA’s DSCOVR climate research spacecraft and a double payload consisting of the ABS-3A and Eutelsat 115 West B communications satellites. The rocket’s next launch has been rescheduled – from the same pad – for April 27, carrying the TurkmenÄlem communications satellite into orbit. The CRS-5 launch is the eighth of the year for the United States and the twenty-second worldwide – including an uncatalogued Vega launch which reached orbit after the primary payload had separated.